But for the sake of ease... does anyone think it's NOT okay to place them under Die Trying's folder tree and give them away? I know with the die trying morphs you can pretty much do whatever you want. Need to read the license agreement again just to make sure lol. Or maybe make an 'Add-ons' grouping that would place yours in their own folder, within DieTrying, but still insert them in the 'main list'. the problem would be you have to keep switching folders to find them... which I find bloody annoying having to constantly dig around. My thought was, since they're free morphs, and I'm adding free morphs to the mix, with whatever restrictions and/or freedoms Die Trying had (which I assume are 100% public domain, though I'm not sure...) I figure it would be easiest for the end user just to have them dropped into his folder tree. I've only made two so far... will make more as I need them. Wherever you put them, I would recommend that they be in your own folder to avoid the possibilities of overwriting files [present, past or future]. I'm still in 4.0 myself, but there's also a thing about each morph having it's very own name ... so while some liked to poke fun at the names I gave my little morphs, they never caused a conflct. Oh I absolutely plan on placing the DSF files in my own folder... but organizing them so that they show up under Die Trying's morphs in the shaping tab, maybe I was unclear. If you look at the way DieTrying's are already organized, you'll notice all of them are 'grouped' in subfolders...plus show up in the 'master' DieTrying list...if you make your folder a 'subfolder', they'll be in the 'main' list like the rest of them...but still separate. I get that... but when I only have two morphs, it seems a little silly have a sub folder for each one. One is a belly button and the other is a nose bump... 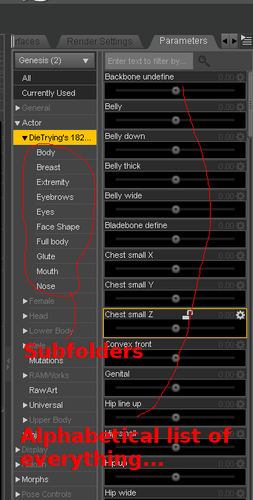 I'm only thinking it would be majorleague annoying to be working on the nose, then have to switch to wancow's sub folder just to add one morph... What I COULD do... tell me if this would be acceptable, is to have one under each. Say DieTrying/Nose/Wancow and DieTrying/Body/Wancow. Would that be acceptable? coolness, that is what I shall do! Thanks MJC! I got several of your morphs, Wancow. They look pretty good. Thanks! And it certainly helps to have a clear statement in your ShareCG notes as to exactly what's needed to use them in addition to Genesis and/or V4 figures--that's been a big gripe of mine for many works out there. I use those morphs a lot but I also miss some. I am looking forward using them. Are you creating V4 or Genesis morphs? The V4 morphs are free without restrictions. The Genesis conversion by SickleYield is also free without restrictions. I currently am creating some additional morphs too. But it will still take a longer time to release it, because I want to create several more I am missing. Especially some more breast options. And - what is a "snubnose"? DT, first off, first time I've communicated with you, so thank you very much for the morphs you made. I'm just doing Genesis as I don't use V4. I've added only three morphs, done in different ways as I need them and organized under your tree for convinience (mine and whomsoever downloads them). On your morphs, ZamuelNow and I are both doing dialed characters using only your morphs. That seems best. I'd like a more noticeable split but at the same time I can acknowledge that bouncing back and forth between multiple categories does have its minor annoyances. -Leg length: Wanting something to help make long legged females without explicitly making them super skinny. Alternate uses are making taller, superheroic males or dialing in reverse for shorter characters with rounder figures. -Neck length: Rather niche and specific, looking to replicate the look of women in some African countries (I believe Kenya is one but I forget). Alternate use is dialing in reverse to give shorter, wide necked appearances. - Bicep thickness: I often dial Arms Petite in negative to make thicker arms but it scales up the forearms rather sharply in higher settings. Would love to see something to counteract that or simply something that works well as a standalone. WOah, wasn't easy finding any pictures of that! It's when the nosetip is pointing upwards.